Developers are being invited to consider a West Coast development site which is able to yield up to 520 residential units. The Urban Redevelopment Authority (URA) yesterday released details of the site, spanning 16,378 square metres in West Coast Vale. The project could be condominium units, or flats, or a combination of flats and strata landed houses subject to approval. URA said serviced apartments will not be allowed. The 99-year leasehold plot has a maximum gross floor area of 45,858 sq m and URA said it is available for application under the Reserve List of the Government Land Sales Programme for the first half of the year. Under the Reserve List system, a site will be put up for tender only if the developer's minimum bid price is acceptable to the Government. 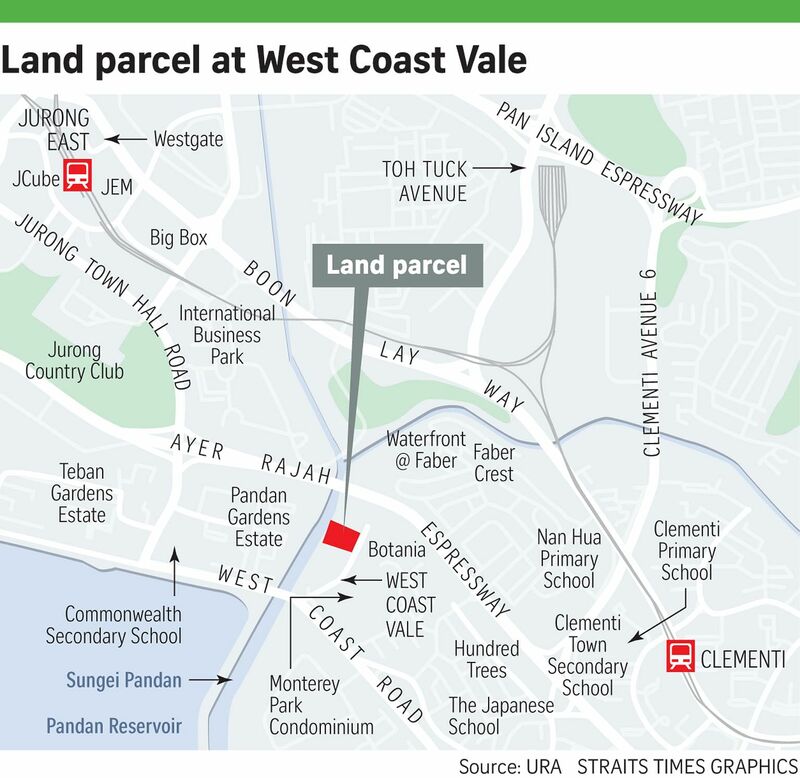 The land parcel is along Sungei Pandan and has easy connections to West Coast Highway and Ayer Rajah Expressway. URA noted that the future project there would be "ideal for families with school-going children" as it is near Nan Hua Primary School, Commonwealth Secondary School and The Japanese School. The site is adjacent to another upcoming condo project, Parc Riviera, by EL Development. Parc Riviera's site was acquired at a cost of $314.1 million or $551 per square foot per plot ratio last August. Analysts told The Straits Times that developers are likely to be cautious in assessing the reserve site in view of the weak economic outlook and competition from other properties in the vicinity. "Developers would have to consider competition from surrounding sites, such as The Trilinq (which is 35 per cent sold), Parc Riviera, and Clementi Avenue 1 site", said OrangeTee.com senior manager for research and consultancy Wong Xian Yang. SLP International Property Consultants executive director Nicholas Mak said that while the site has some positives, a major disadvantage is that it is relatively far from MRT stations and amenities. "If this site is launched for sale by tender today, the estimated land price would range from $246.8 million to $271.5 million ($500 to $550 psf ppr). The tender would not attract more than six bidders," Mr Mak cited as an illustration. R'ST Research director Ong Kah Seng suggested that the site may not garner immediate interest from developers. "Even if the developers are in need of land for residential development, there's still high risks and uncertainty lingering... I expect the site to be triggered for sale at the earliest in the fourth quarter of 2016 - or even early 2017," he added.